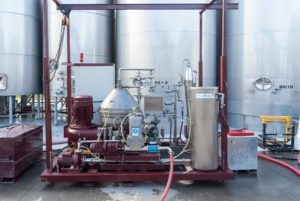 Vintech Pacific operate the mobile, skid-mounted STS45 centrifuge from Separator Technology Solutions in Australia. This versatile technology is highly effective for clarification of both wine and beer at various stages of the production of either. The STS45 is a high-speed, centrifugal, vertical, self-cleaning, two phase, disk-type clarifier. Its advanced design, which features both hydraulic seals and the ability to inert-gas blanket, means that a key advantage of the STS45 system over older centrifuges is a very low oxygen pick-up, as low as 0.02mg of oxygen per litre of wine or juice. Further, the STS45 is highly efficient at minimising product losses. Solids are ejected at >95 percent (v/v) dry so that no further product recovery is necessary by lees filter or RDV. The system will remove solids from white juice immediately, rendering it ready for fermentation without cold settling or the need for SO2. Both the upper and lower bowl are jacketed for superior temperature control. This technology can be used to arrest fermentation by removal of yeast or to remove proteins bound to bentonite. Likewise, the STS45 is highly effective for the recovery of both red or white wines from gross lees, post-ferment. In beer production, the STS45 offers rapid hot wort separation and green beer clarification, while maintaining oxygen pick-up at or below 0.02mg per litre. The centrifuge is fully automated and features an Alan Bradley CPU and colour control panel. What’s more, as with all Vintech Pacific mobile technologies, one of our highly-skilled wine technicians are on-site to operate and supervise the system ensuring rapid and efficient work flow. To discuss how Vintech Pacific and our STS45 centrifuge technology can bring efficiencies to your winemaking program, please contact your nearest Vintech Pacific regional office.